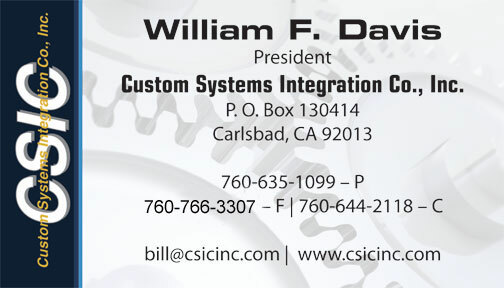 For Over 30 Years Custom Systems Integration Co., Inc. has served the packaging and plastics industries. Some of the products and services offered include: Integrated Modular Conveyors for Packaging Filling or Assembly Systems Product Handling & Automation Systems Consulting Swan-Matic Semi-Automatic Capping Devices Intermittent & Continuous Motion Assembly Elevator & Vibratory Bulk Hoppers Centrifugal & Vibratory Feeders Air Bearing Technology Systems Labeling Systems. For more information please contact Bill Davis at the contact info above.